MIAMI. Fla. – Ryder System has named Christopher Barnett its 2018 Top Technician. The 2018 Ryder Top Tech winner Christopher Barnett holding his $50,000 check alongside Ryder Senior Service Manager Josh Ison; President of Global Fleet Management Solutions Dennis Cooke; Vice President of Maintenance & Engineering/Top Tech Chair Bill Dawson; Senior Vice President & Global Chief of Operations Tom Havens; and Chairman & CEO Robert Sanchez. Barnett won the company’s Top Tech Recognition Program for North America last week. The contest, designed to identify, recognize, and reward Ryder’s top performing truck maintenance technicians, hosted its competition final at the Henry B. Gonzalez Convention Center in San Antonio, Texas. 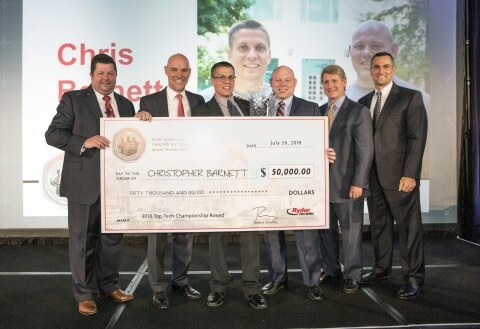 Barnett previously won the Ryder Top Tech Competition in 2009, and he was previously crowned the American Trucking Association’s (ATA) Technology & Maintenance Council National Technician Skills Competition Winner (TMCSuperTech) in 2012. Barnett took home a US$50,000 prize. The Top Tech finalists went head-to-head in a series of 10 rigorous skill tests, including vehicle electronics, preventive maintenance, and air conditioning. In addition to a $10,000 cash prize, these finalists were rewarded for their hard work with a week of fun in San Antonio. Ken Bilyea of Canada…great journalism Truck News.